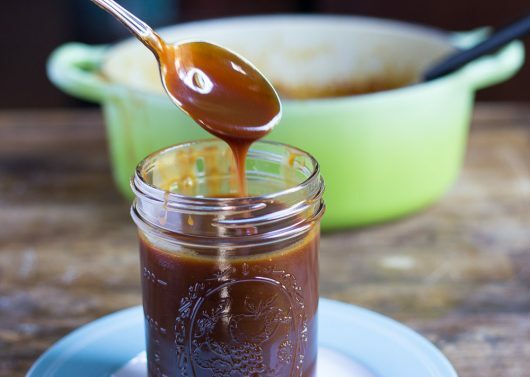 Who can resist Salted Caramel Sauce? Not me! The homemade version has a deep, roasted flavor that puts store-bought caramel to shame. It’s a cinch to make from scratch. All you need are four simple ingredients and a healthy sense of adventure. 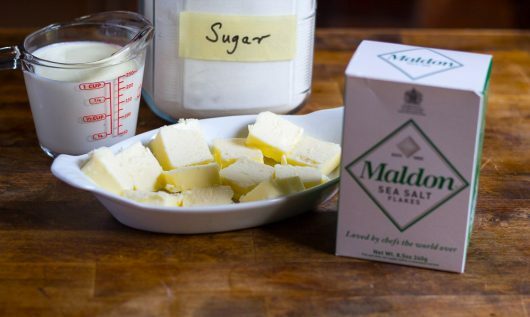 Here’s what you’ll need: 2 cups of sugar, 1 cup of warmed heavy cream (I heat mine for exactly 1 minute in the microwave oven); 12 tablespoons of room-temperature butter, and 1 tablespoon of flaky, high-quality sea salt. To start, tip the sugar into a heavy, 2-3 quart sauce pan. Set the pot over medium-high heat, and whisk slowly and steadily until the sugar begins to melt and clumps start to form — about 3 minutes. Then set the whisk aside, and simply swirl the pan from time to time as the sugar continues to melt. 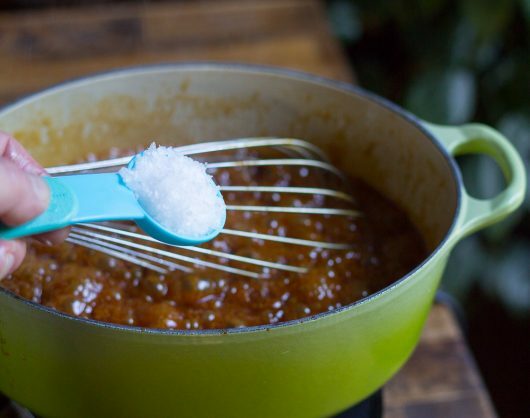 For salty-sweet caramel, let the sugar color only to the amber stage. For a deeper, more “roasted” flavor, let the sugar cook until a pale maple color is achieved. Working quickly, whisk the room-temperature butter into the pan. Warning! When the butter is added, the sugar will bubble furiously. Have no fear! Just clutch your pearls and keep whisking away until the butter is completely incorporated — about 20 seconds. 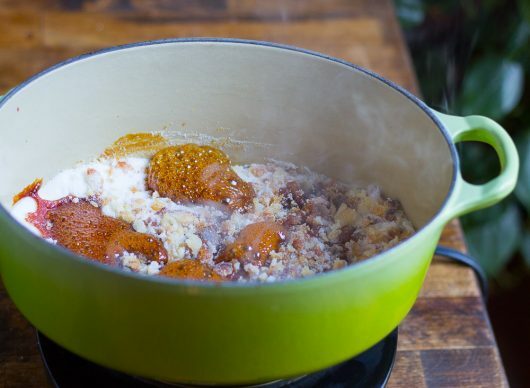 While bracing yourself for another volcanic eruption, whisk in the cream in a slow, steady stream. Then whisk in the salt. And that’s it! Remove the pan from the heat, and let the sauce cool for 10-15 minutes. Or funnel it into an attractive glass cruet. A jar or cruet of Salted Caramel Sauce makes a terrific holiday gift. But we’re not gifting our sauce today. We’re hoarding it for ourselves, and drizzling it over vanilla ice cream, plain yogurt, apple pie, crisp apple wedges, chocolate cake, and some very serious brownies. And when no one is looking, we’re spooning the sauce directly into our mouths. So…who’s gonna give this King of Dessert Toppings a go? You can let me know by leaving a comment. I love hearing from you! Salted Caramel Sauce is the king of toppings. It's delicious on everything from apple wedges to brownies. It's easy to make, too. All you need is four simple ingredients. Put the sugar in a heavy, 2-3 quart sauce pan. 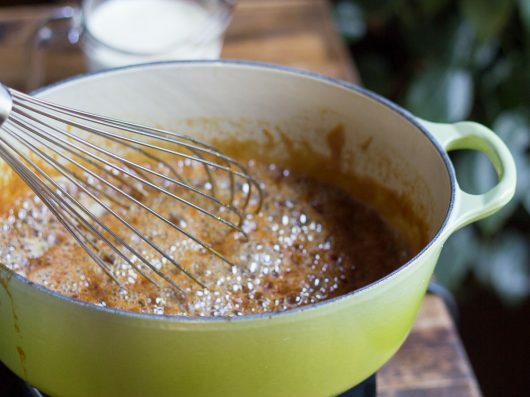 Set the pan over medium-high heat, and whisk slowly until the sugar begins to melt and clumps start to form. 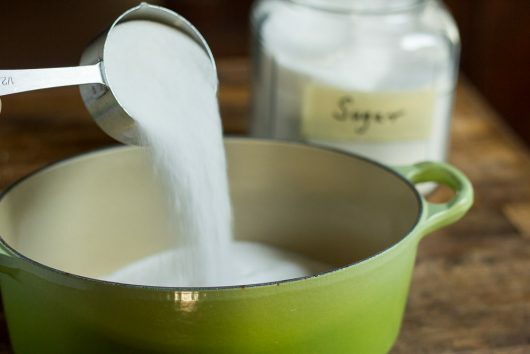 Stop whisking, and as the sugar continues to melt, simply swirl the pan from time to time. 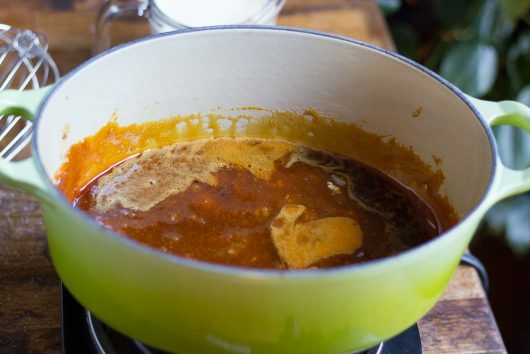 For a mild, salty-sweet sauce, let the sugar color only to the amber stage. For a deeper, more robust flavor, cook until a maple syrup color is achieved. Whisk in the butter (the sugar will bubble furiously at this point). 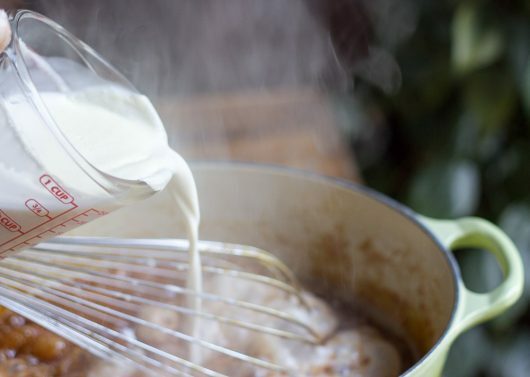 Whisking continuously, add the cream in a slow, steady stream. Whisk in the salt, and remove the pan from the heat. Let cool for 10-15 minutes. Transfer the sauce to a glass jar or cruet. When completely cool, cover and refrigerate for up to 3 weeks. Reheat sauce before serving. I know that it will not last long, but how long will it keep? Hi Diana – Storage time is mentioned in the printable, but I forgot to include it in the step-by-step: 3 weeks if refrigerated. Enjoy! Oh Kevin, this is going to made, maybe not this weekend, but it will happen…when I’m all alone and can have it all to myself. Thank you. Do you think this could be processed in a canning waterbath to preserve it? OMG! I must remember to wear my pearls while whisking. Kevin you are a treasure. 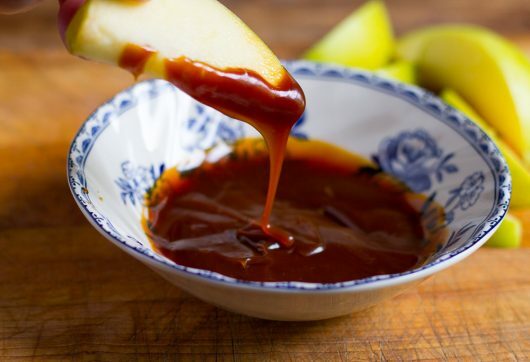 Caramel sauce was a childhood favorite. Now I can have it again. I never thought of making my own, many thanks!! I absolutely love anything caramel. Thank you for this recipe that looks drool worthy. I so enjoy your writing and sense of humor. I often laugh out loud when reading your posts. Wow, just finished making your Heavenly Challah Bread and wondered how I was going to store the leftovers and seen this! Looking forward to another delicious recipe to try and perfect timing for all the Fall apples to use in dipping and Carmel apple pies! Can’t wait, thanks for sharing! people wouldn’t make this, why? Thank you! What a delicious way to enjoy this Fall season. Hi Joanne – Because this caramel contains dairy (butter and cream), it is not suitable for canning. Fortunately the sauce will stay fresh and wonderful for at least 3 weeks in the refrigerator. That is, if your willpower is stronger than mine! Thanks, Kevin, for another wonder from your kitchen! I can’t wait to make it and dip some Golden Delicious apple slices in it. I am going to try it on apple pie too. I’ve always wanted to and never have. It just sounds so yummy. Will make it today to top my apple crisp dessert.Would also be good on baked winter squash or yams! Hi Kathy- Thanks for these delicious, delectable, and de-lovely ideas! Is it really necessary to add salt at all to this recipe? I wonder why the trend in all things being extra “salted” these days in order to be tasty — salted caramel, salted chocolate, even the top of the quiche I had at a restaurant the other day had additional large granules of sea salt on it. A little salt is often required in a recipe for the chemistry but I hope this trend of so many dessert items being extra salted runs its course soon. Over crisp apple slices – yes! What a great idea. Thanks, Kevin. I just discovered a pricy yogurt flip that has salted caramel. Now I can enjoy plain yogurt with the sauce. 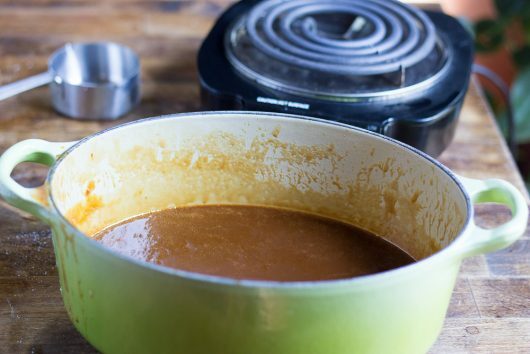 Thanks for the perfectly timed caramel sauce recipe. You’re the best! My daughters and I are convinced that we have the genetic constitution to need caramel in our lives for the purpose of survival. We can easily look away from chocolate. However, the mere whisper of some slightly darker than amber colored sugar sends us into a frenzy. I am glad you have an appreciation for the real thing as opposed to those little plastic wrapped squares. We will be stirring up some trouble to go with our Michigan apples today. Could this be made without the salt? If so, are any adjustments needed?? I don’t “get” this sudden fad of putting salt in caramel! I think it tastes vile, not to mention I’m already on 3 different medications for high blood pressure! Hi Ana – I must have the same genetic constitution that you and your daughters have. Hi Jeanne and Casey – If you omit the salt (or just add a pinch of it), you’ll have ordinary caramel. Enjoy! This is a gotta make it one! Thank You Kevin! I have plain yogurt in the fridge right now, begging to be topped with this dreamy golden brown coating. I love that you funneled your caramel sauce into an olive oil cruet, very attractive. 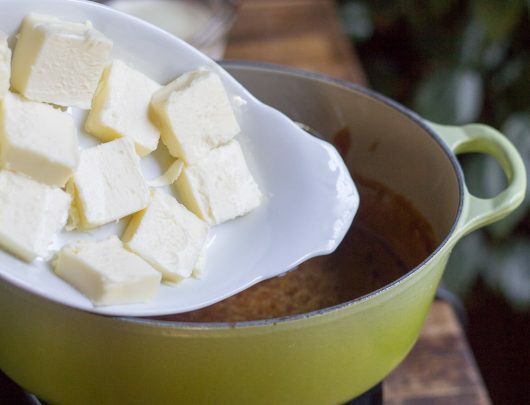 Also, you have given the easiest instructions for making caramel sauce. 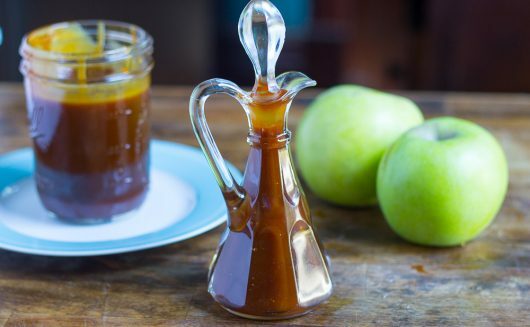 I have always found your way of making caramel sauce the best way and is how I first started making mine way back when. Then one day someone told me I should use a candy thermometer, which I did try only to experience failure after failure. I have since gone back to the way you do it. A trial run before Thanksgiving and then as a perfect add on for apple pie-count me in! Hey Kevin, sounds delish and doable. I would use most of it over Granny Smith apples, but was wondering if the remainder could be used to put together home made turtles or if this recipe would not firm up. Maybe chilled? Hi Celia – I think you could, in fact, use this caramel for turtles. The sauce firms up as it cools to room temperature. Enjoy! I love how you give us the technique to so this. Thanks! I just love your posts and recipies!! You make it all so fun. I look forward to your emails and sharing of your ideas and life. Thanks, Kevin. Hi Monique in Holland — I’m so glad the salted caramel sauce worked out for you. Sounds like the 3 of you had a fun evening!